One of my favourite lines from Shakespeare’s Romeo and Juliet is “O, swear not by the moon, th’ inconstant moon, that monthly changes in her circle orb.”. It has always reminded me of the child that Juliet was, her innocence and wonder in this heavenly orb that appears to change as if by magic. It unnerves and mystifies her, yet she clearly finds it most beguiling. Science has shown us that, in fact, astronomical bodies are mostly consistent and predictable. We can even predict the future changes within our own solar system and beyond. It is thanks to science that I was able to watch and photograph the magical changes of Monday morning’s lunar eclipse that rendered our moon blood-red for a time. Change is a constant in nature and life. It can be frightening when it’s not understood and liberating when it’s embraced. I have tried shooting in RAW but have to say that all the post processing really does my head in! I can see why it would make sense in this instance though. Yes, a lot of both! Perhaps a touch of lunacy too 😉 I was absolutely determined to do it and finishing the montage was just so satisfying!! Most of the processes within the Adobe RAW converter are very similar to those in Lightroom, if you know how to use that at all. Whenever I find something that I can’t figure out for myself I just Google tutorials! For me, RAW is the only way to go, and I’ve been doing it for a decade now. It often depends on what I’m photographing! Most music festivals and events I shoot in jpeg to make processing quicker and save on memory. This is a spectacular composure image. 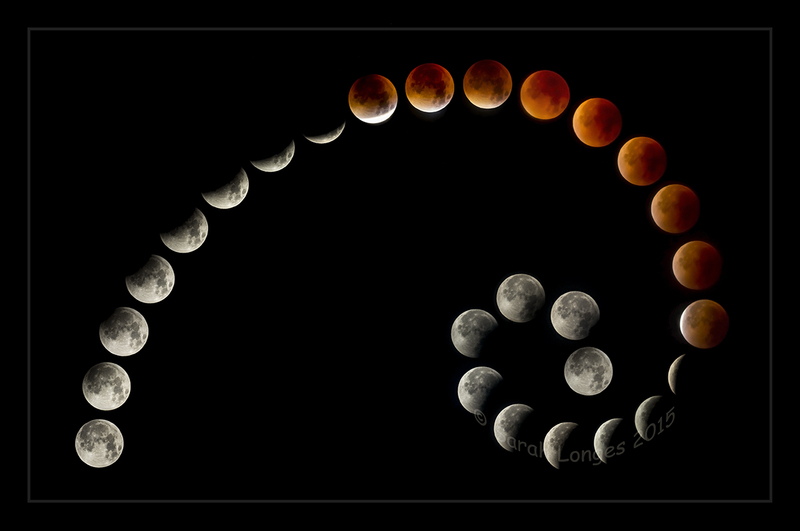 I love the way you’ve arranged the moon images in a curve. Then you are even more clever than I thought. There’s nowt wrong with being a nerd. I have several nerdisms myself. Wow, this is ona amazing piece of art …. Now I understand what you are all about. Fantastic work … Congratulation! Thanks Viveka 🙂 Yes, I really did put my heart into this piece. I feel blessed to have been able to witness the entire eclipse! It shows … how many images did you take in total???? I have never worked in such high ISO! I just put my Canon on night mode. I’m too impatient to take shots manual. I let the camera do the thinking. *laughing I know that the results will be much better to – and look at yours – it paid off big time. Fantastic art, Sarah. I think most cameras automatically set to 1600 ISO for night mode. The CMOS sensors on modern digital cameras are so much better at high ISO noise reduction and steady shots! The trouble with a lot of auto functions is a tendency to overexpose everything and you can end up loosing detail. The change in light as the moon is gradually obscured is quite something! I usually photograph a full or nearly full moon on 100 ISO at f11 and 1/500th exposure or thereabouts depending on various conditions. The moon, full and fully risen is very, very bright but a moon just clearing the horizon or a crescent moon can often require a long exposure. Thanks so much Viveka! Thanks for the tips … I will try to put into my hard drive and maybe I remember next time I look at the moon through my camera. Same with the sun it creates a lot of overexpose – even if it’s in my back. And the sky disappear. Have to take a course I think. Getting the right filters makes a big difference with the sun! I have polarisers for all my lenses 🙂 Have fun experimenting! Okay, I’m not able to add a filter on my compact camera. What make do you have? I think some of the compacts can take filters although not many! An alternative is to get the square filters, like cokin, and actually hold them in front of the lens. I have Canon SX50HS – me holding a filter … I doubt very much .. have enough to do to focus the object. *laughing. A composition idea that’s been in my mind for a while for a moon montage! There’s lots of underlying reasons that are personal to me and my relationship with nature and science but I’d bore everyone silly if I went into it all 😉 I was so happy that it worked out how I had envisaged it! Whoever would have thought that the South of England in autumn would have been the right place to be at to view an astronomical event?!? I shall be chasing solar eclipses next 😉 Cheers Dan, glad I was able to share with you! Me too, Sarah :-)) Cheers! Fantastic image and interpretation of the challenge! I’d love to include it in our “Photos We Loved” roundup next week. Sarah, I’ve just sent an email. Thanks! Thanks Cheri 😀 I’d be absolutely chuffed to have you share it! I’m speechless… Thank you for sharing with us, Sarah!! Now that is just showing-off Sarah…;0). Lovely sequence of images to achieve an original idea. I hope hubby had an extra specially nice birthday. Pahahahaha 😉 Cracking me up Mark!! Simon chuckled too. Yes, he’s been spoilt rotten today as he thoroughly deserved to be!! Really nice to have had time together this week 🙂 Thanks my friend! This is brillant! Perfect for “Change”! Oh Sarah .. How amazing. And how nice of your hubby to stay and keep you company. What a guy! Happy birthday Simon .. Thanks Julie 🙂 I spoilt him rotten today of course!!! He doesn’t even realise just how wonderful he is and what a romantic thing it was to stay out with me all night in the cold weather. He’s always so proud of what I do! He just loved what I did with the sequence. I always love seeing the look on his face when I reveal a piece of work to him 😀 We’re all still children at heart chasing moonbeams! Today he helped me clamber down a river bank and passed all my gear safely down so that I could wade around getting long exposures for a post tomorrow 😉 I discovered that I need waders instead of just my wellies! He thought it was hilarious and it was 😀 I definitely think we’re the growing-old-disgracefully type of couple! Like a string of moonstones!! Brilliant work Sarah kudos to you and hubby!! Magical image. Thank you for sharing this special experience. I’ll join in all the encomiums. You did yourself proud. This is definitely my favorite composite shot from the recent blood supermoon! I had thought the straight line in the photo was a shooting star, as well, but another night photog informed me that actually it was probably the Int’l Space Station, or a flare from a passing satellite. Iceland is supposed to be quite the photographer’s dream — I hope to get there someday too! Thanks so much for browsing and commenting :-). Spectacular, Sarah! Congratulations on being included in “Photos We Loved” today. Well done! Congrats on being featured today! Well done! Thanks Leya, and congrats to you too! One of the things that I love about photographing London is that wonderful mix of historical and modern architecture 🙂 It can work beautifully! ThanQ 😀 I absolutely loved creating this one! What an inspired image! Kudos for sitting out on a cold hillside, and for the Fibonacci design! Thank you so much Lara 🙂 It was just amazing watching the entire eclipse! The British weather usually spoils these things so I think we were incredibly lucky!!! Hello Sarah, congratulations! Well deserved. This is what I call a clever and superior image, of someone who sees beyond the lens, as a true artist-photographer. Will follow you along. Thanks Lucile and welcome to blog 🙂 Good to have you here! I started out in Fine Art painting and photograph so, yes, for me photography is all about creating a piece of art. Painting with light as it were! I would have been happy to take one beautiful shot of that moon. To do a perfect series and arrange it as beatifully as you’ve done here? Well that would be amazing. Lovely work. Absolutely breathtaking! It’s awesome to see the entire event as it happened. I kept going inside and out, taking a few photos but was unable to see the beginning due to heavy cloud cover. To see it in it’s entirety is amazing! You are so very talented and thank you. I can’t wait now!! Much as I love our beautiful countryside and wonderful wildlife, there’s far too much stress everywhere in the UK. It’s also silly footie season with the Euro Championship!! It brings out the worst in English fans at home and abroad and totally takes over TV and radio. If you don’t like football (like me and Simon!) it just gets boring and embarrassing! Funnily enough I do like the rugby! Both Union and League. It’s such a different atmosphere around the sport though. I grew up with it really and my brother was a county and university player until he really bust his ankle up. My cousin’s hubby plays for the international Australian team, the Wallabies, who England are touring against at the moment! Lots of family teasing between here and Aus 😉 Honestly, here all rugby fans can sit together and have a laugh even though we support different teams. It’s not like the fanaticism that builds up around footie thank goodness! I’d never get depressed over my team not doing well. Sport has ups and downs so you just have to roll with it and not treat it like some life or death situation! South Africa is big on its cricket too isn’t it? Too boring for me! A pity about your brother’s busted ankle and that something like sports can cause such injuries. Ha! Not around here. Some people can become really depressed and there have been fights because of the teams. Still can’t understand how and why. LOL! Variety is the spice of life eh? Ah, now I do love watching the ice skating pairs!! Amazing routines 🙂 I actually look forward to the Olympics every four years as there’s so much variety of sport to watch that often isn’t shown. I enjoy the atmosphere of it too as it often showcases amateur rather than professional sports. I do as well and of course, ballroom dancing. It’s good that he still have contact with them and nothing wrong with snooker either. That is a sport where you must know what you’re doing for sure. Hubby loves playing the snooker games. Yeah we have lots of great motorsports here 🙂 I live just up the road from Brooklands which is where the first ever Grand Prix was held! The track is broken up now but a few sections remain and parts are in the Brooklands Museum which is a great place to go. It’s set next door to Mercedes-Benz World which is another great place to go though I actually got stuck in one of the sports cars one time as it was so low down I couldn’t get up and Simon had to rescue me 😉 There’s an original Chitty Chitty Bang Bang car used in the film at the museum which the kids love to see. Glad to hear you appreciate snooker too! A lot of skill in it. I was never particularly good but loved playing 🙂 Yes, ballroom is beautiful! We have a program on TV every year leading up to Christmas called Strictly Come Dancing where celebrities partner with professionals to learn new dances each week. Some of them are absolutely brilliant!! Some of them are hopeless but funny 😉 It raises money for charity too. Tired today so I have the tennis on as background noise. Also strangely relaxing!! Definitely! I also played from time to time but my fav pastime was darts in my younger days. We even had championships. I felt like that this weekend. Been working too hard in the garden and then I enjoy it so much that I forget about the suffering afterwards. LOL! I used to complain that I was always standing in a hole 😉 I do love to laugh at myself! My favourite colour as well and he does indeed. Just like a little lion with a foxy face. But he keeps me busy hey. He is at the stage where he picks up everything he sees. Very curious and inquisitive. Just like a little baby who started crawling and wants to try out everything. LOL! Yeah, they’re just like kids!! Of course they don’t ever really grow up 😉 At least it’s easier training a dog than cats!! !